This species is widely distributed throughout the Mississippi River drainage, including the Tennessee and Cumberland River basins, and from western New York west to North Dakota and Nebraska and south to Louisiana and eastern Texas. It is considered stable throughout its range. Comments: Externally, the pink papershell is flattened with a dorsal wing that becomes jagged with age. The shell color is chestnut brown and has a shiny luster. 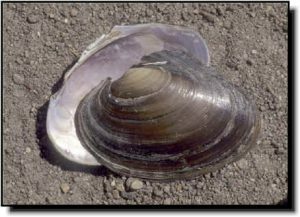 As the name implies, the shell is very thin with dark pink or purple nacre from margin to margin. The shell from a dead specimen may crack as it dries. It is often confused with the fragile papershell, but differs in having a more rounded ventral surface and a darker shell color. The pink papershell is most common in still water but can occur in low numbers in rivers. It can be found in central Kansas within several sandy streams and the Arkansas River. 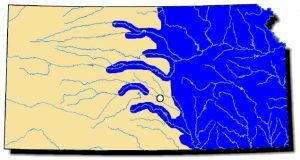 Because it is adapted to live in ox-bow environments, it sometimes reaches high numbers in some reservoirs. It apparently does well in silty substrates that many other species cannot tolerate. It has been used in studies to detect the toxic effects of ammonia.